California Internet, L.P. DBA GeoLinks (“GeoLinks” or the “Company”) submits these comments in response to the questions set forth in the Public Notice issued on May 1, 2018. 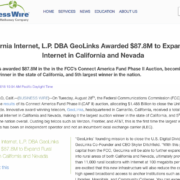 GeoLinks is proud to service the largest coverage area of any single fixed wireless Internet service provider (“ISP”) in the state the California. The Company’s fixed wireless technology platform depends on access to spectrum resources sufficient to support enterprise-level broadband connections. Millions of Americans lack what is, by today’s standards, considered high-speed broadband access – especially in rural areas. Sparsely populated rural areas are not well suited for traditional, wired broadband service given the cost to build and deliver a cable/ fiber-based network. However, fixed wireless broadband technology can provide high-speed broadband to consumers in these areas for a fraction of the cost. For this reason, it is imperative that spectrum resources be allocated in ways that allow fixed wireless ISPs to deploy services to these regions. Over the last two years, GeoLinks has made it a Company priority to reach more unserved and underserved areas within California and beyond. 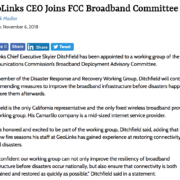 GeoLinks believes that the 3.7 – 4.2 GHz band offers an opportunity for the Commission to allocate spectrum resources in a way that will promote competition and help bridge the digital divide while protecting current users of the band. Specifically, the​ ​3.7–4.2​ ​GHz​ ​band​ ​is​ especially ​well-suited​ ​to​ ​support​ Point-to-Multipoint (“P2MP”)​ ​broadband​ ​access. 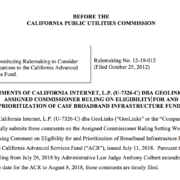 As such, GeoLinks urges the Commission to affirmatively state the feasibility of commercial wireless applications and its intention to assess how the band can be properly allocated to maximize public benefit in its 3.7-4.2 Report. As GeoLinks has previously stated, the Company supports shared, licensed P2MP use of the 3.7-4.2 GHz band. As an initial matter, P2MP service options are ideal because they allow a wireless service provider to provide high-speed broadband connections to several end-users (i.e. several households throughout a community) from one location, requiring fewer towers and less equipment than point-to-point connections. If sufficient spectrum is available, providers can use P2MP technology to deliver gigabit and near-gigabit speeds to customers. In addition, because P2MP services are wireless, use of this technology eliminates the need for costly, time-consuming and disruptive construction that is generally associated with fiber buildouts. This is especially beneficial in rural and high-cost areas and can provide much-needed competition to incumbent providers in urban and suburban areas. Despite the benefits of this technology, as the Broadband Access Coalition explains in its Petition, there is no licensed mid-band spectrum allocated for fixed P2MP service than can enable gigabit speeds. However, for the reasons stated in the Petition, the 3.7-4.2 GHz band is well suited for the provision of gigabit or near-gigabit wireless broadband connectivity via P2MP connections. With the appropriate rules, the Commission can ensure P2MP use is feasible in the band, which will result in more affordable, high-speed broadband and increased broadband competition. 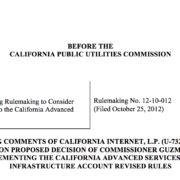 GeoLinks urges the Commission to address this possibility in its 3.7-4.2 GHz Report. As GeoLinks addressed in previous filings, traditionally, fixed wireless ISPs have operated in unlicensed bands (i.e. 2.4 and 5 GHz). While this has allowed for successful deployment of internet services in some areas, the availability of unlicensed bands is not a one-size-fits-all option and congestion and interference can occur in areas with numerous providers seeking to use these frequencies. With respect to the 3.7-4.2 GHz band, as discussed in more detail below, GeoLinks urges the Commission to make spectrum available on a Part 101 or “light licensed” basis, not an unlicensed basis. 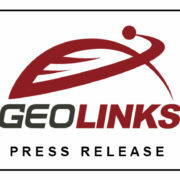 GeoLinks believes that if the Commission were to create rules to allow unlicensed use in the 3.7-4.2 GHz band, it would cause the need for additional administrative oversight and monitoring that would both render the band less usable for commercial wireless services and negate the benefits of unlicensed spectrum use. First, the Commission would need to carve out a specific section or sections of the band for unlicensed use large enough to accommodate high-speed broadband services. This could possibly require the need to shift existing users to other frequencies within the band. In addition, it would require ongoing policing of the band to ensure no unauthorized use spilling into adjacent frequencies, which could cause significant interference to other band users. In all, it could create significant administrative burdens to both the Commission and existing users in the band. For these reasons, the Company asserts that the 3.7-4.2 GHz band may not be the most appropriate band for unlicensed uses at this time. As addressed in the Petition, the Commission’s current “full-band, full-arc” policy has led to underutilization of the 3.7-4.2 GHz band. However, this policy can be revised in a way that will maximize the usefulness of the band. As an initial matter, GeoLinks seconds the Petition’s suggestion that the Commission require current users of the band to report updated location and technical information to the Commission so that it can update its FSS earth station database. GeoLinks (as well as other wireless broadband providers) can coordinate its use of a frequency around any fixed point that may be necessary (i.e. an FSS earth station). As a fixed wireless broadband provider, GeoLinks has the flexibility to design its network in any way necessary to maximize spectrum resources and avoid interference. As such, GeoLinks believes that an important first step for the Commission to take to assess the feasibility of allowing commercial wireless services in the 3.7-4.2 GHz band is to assess where within the band interference could occur. With this new information, additional band users can avoid transmitting in the immediate vicinity of an FSS provider or in a way that causes interference. Second, GeoLinks recommends that the Commission allow sharing of the 3.7-4.2 GHz band. As noted in the Petition, the Commission has had demonstrated success with “light licensing” and spectrum sharing regimes in other bands. GeoLinks agrees that this type of licensing regime would prove successful for the 3.7-4.2 GHz band, as well. Specifically, GeoLinks supports Part 101 frequency coordination to avoid interference while allowing additional users to fully utilize the band for broadband services. In addition, GeoLinks asserts that because the Commission has successfully implemented these regimes before, it can attest to how they have worked in other bands in its 3.7-4.2 Report. GeoLinks urges the Commission not to base feasibility of the band for commercial wireless uses on whether those uses will immediately include mobile wireless. As explained in the Petition, the band “is not now, and will not for several years, be suitable for mobile use given the existing deployment of FSS earth stations and FS P2P links.” Instead, GeoLinks urges the Commission to recognize the feasibility for P2MP fixed wireless commercial uses that could be deployed in the band ASAP to help bring gigabit and near-gigabit speeds to rural, unserved areas of the country. As GeoLinks has advocated in previous filings, any spectrum license should carry with it the requirement to serve the public interest – including for shared or light licensed spectrum. Spectrum is, first and foremost, a public resource and should be allocated accordingly. As part of its assessment regarding the feasibility of allowing commercial wireless use of the 3.7-4.2 GHz band, the Commission must consider what steps will be necessary to ensure successful and efficient use of the band once such uses are allowed. GeoLinks recommends that the Commission affirmatively state in its 3.7-4.2 GHz Report that any additional use of the band will be subject to strict buildout and service requirements to help promote broadband deployment in rural areas. These requirements will alleviate the risk of spectrum warehousing and encourage rapid deployment of high-speed broadband by band users. Broadband Access Coalition, Petition for Rulemaking to Amend and Modernize Parts 25 and 101 of the Commission’s Rules to Authorize and Facilitate the Deployment of Licensed Point-to-Multipoint Fixed Wireless Broadband Service in the 3700-4200 MHz Band, RM-11791 (filed June 21, 2017) (“Petition”) at 4. 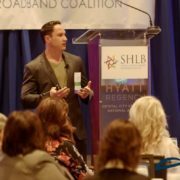 “The 3700 – 4200 MHz band satisfies two fundamental requirements for spectrum to provide high-speed fixed wireless broadband access to residential and small business customers and to community anchor institutions. First, the 3700 – 4200 MHz band has excellent propagation characteristics compared to high-band spectrum, offering near-line-of-sight (“nLOS”) capability at low power for last-mile services. Second, the band has 500 megahertz of contiguous spectrum, an amount sufficient to accommodate twenty-five 20 megahertz channels that can be bonded to create larger 40, 80, and 160 megahertz channels. These wide channels facilitate the provision by multiple entities of last-mile fixed wireless broadband connectivity at gigabit or near-gigabit speeds.” Petition at 4. GeoLinks believes that a minimum of 120 MHz of clean spectrum (with no interference) is required to provide gigabit or near-gigabit broadband speeds. This position is also shared by other parties. See e.g. Comments of the Competitive Carriers Association, RM-11791 (filed August 7, 2017) at 2 and Comments of Starry, Inc., RM-11791 (filed August 7, 2017) at 1. “Part 101 frequency coordination will ensure that the incumbent Fixed-Satellite Service (“FSS”) and terrestrial point-to-point (“P2P”) Fixed Service (“FS”) will not suffer harmful interference from band-sharing with P2MP.” Petition at 1.